New Google Maps 2013 Review. Discover the World! Google Maps is one of the most impressive services offered by Google and in this video we are going to look at the update that has recently been made to the mapping service. The first thing you will notice when you use the new interface is that it looks very different. The map now takes up the entire of the web page where as previously it was a window on the right. 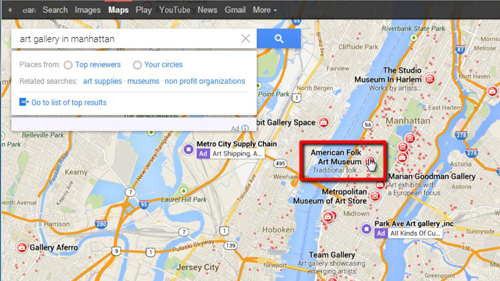 The search box still appears in the top left of the map, so let’s use this to run a search for something, here we are going to search for “art gallery in Manhattan”. Several icons will appear on the page and you can click on one of these to get more information. In the window on the left you will be given details and an address. Photos and reviews will appear below. You can click on any one of these to get more information. Integration with Google Plus means that there are reviews available from the social network in maps. You can access street view by clicking on the image on the left. 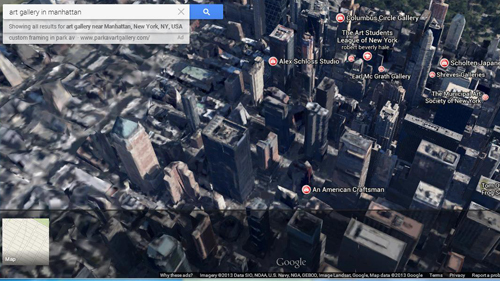 You will ‘fly’ into street view, another nice graphical addition to the program. Once in the street view area you will be able to use it as you did in the previous version of maps. Let’s go back to the overhead map view by clicking the icon in the bottom left of the screen. Now, we are going to go to “Earth” which is a combination of satellite view, which was a feature of Google Maps previously and the Google Earth software which could be downloaded to your computer. Once the view has loaded zoom in and you will see that there is a perspective on the buildings, this is because they have been modeled in 3D. To get a better perspective of this, click the “tilt the view” icon on the right. This will give you a more angled view over the city, as you can see the 3D on the buildings is very impressive. These are just a few of the most fundamental changes to Google Maps in the new update and you will probably agree that it is a rather impressive improvement.